karres+brands, in collaboration with EFFEKT, Atkins, CFBO and Trafikplan, won the competition for the development of the master plan for Helsinge Garden City in Denmark. 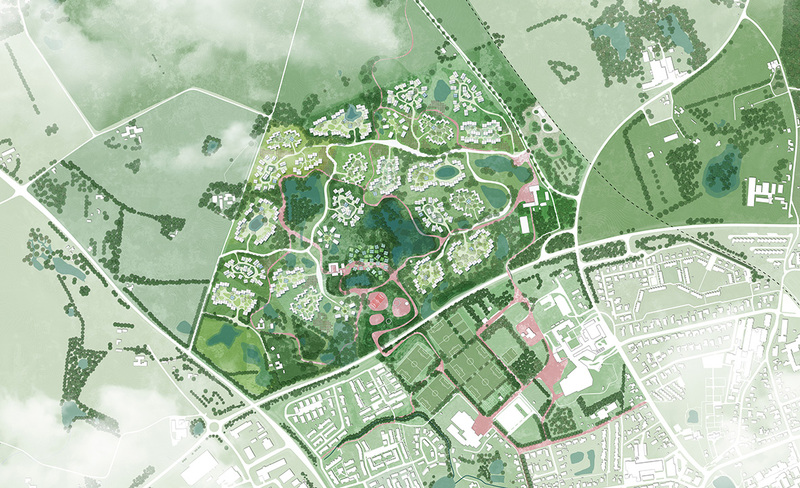 The master plan covers 65 hectares and embodies a strategy for the development of 700 houses, the integration with landscape, sustainability and internal access and wayfinding. Today, many young families have a desire to move to the countryside to be closer to nature, fresh air, affordable living and to provide a better environment for their children. However, due to intensive farming and a prioritization of car transportation, the landscape is to a large extent inaccessible to the rural population and the existing building mass is outdated and cannot fulfill the dreams for young families anymore. Many urban residents hesitate to move to the countryside due to a lack of good public transportation, the distance from job opportunities and the lack of alternative housing forms. As the concept of work changes, the supply of jobs and the transportation options will be less important and the urban-rural movement can seriously take off. 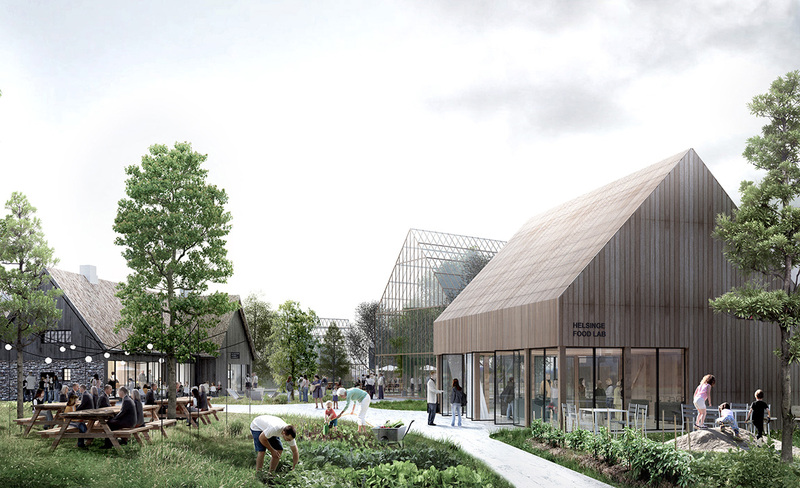 Helsinge Garden City is a proposal for a new way of living in the Danish countryside, in close connection to the surrounding landscapes, with a strong identity and sense of community. The settlement is structured in clusters, with a large amount of common spaces and a high degree of sharing that enables a more sustainable way of living. 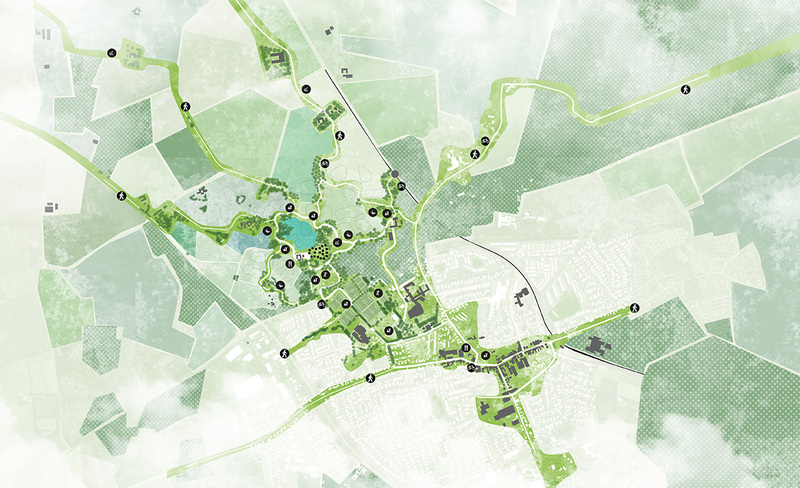 The master plan has been developed with three main parameters in mind: environmental, social and economic sustainability, which together will provide new possibilities to live a more healthy self-sufficient life, in close connection to the landscape and in commuting distance from Copenhagen. The master plan for the new village community is an organic plan, where landscape and settlement blend together. In order to strengthen community life and create a stronger relation to the surrounding landscapes, the settlement is developed as dense living clusters, with a limited amount of private outdoor spaces. The landscape and the in-between spaces are common areas, used for recreational purposes and with production of food integrated in the landscape, such as fruit orchards, permaculture and husbandry. To create a neighborhood with social diversity, both regarding income and lifestyles, the clusters differ in form, materiality, sizes and types of ownerships. However, all houses have a private outdoor area and a direct connection to the common landscapes. The clusters will be developed as 25 small villages, with each their own characteristics, inspired from the qualities of their location. As in the old Danish villages, they are all structured around a common, a pond or a square, where the community and public life can unfold and thrive. A food hub, centrally situated in the new area will be the main driver and meeting point for both locals and visitors. The identity of the new neighborhood is crucial to attract new types of residents and together with the transformation of the landscape, the food hub will provide social and food related activities such as markets and gathering days, which will be the key to create a strong identity and an awareness of the new area. It is expected that the construction of the first clusters will start in 2017-2018.